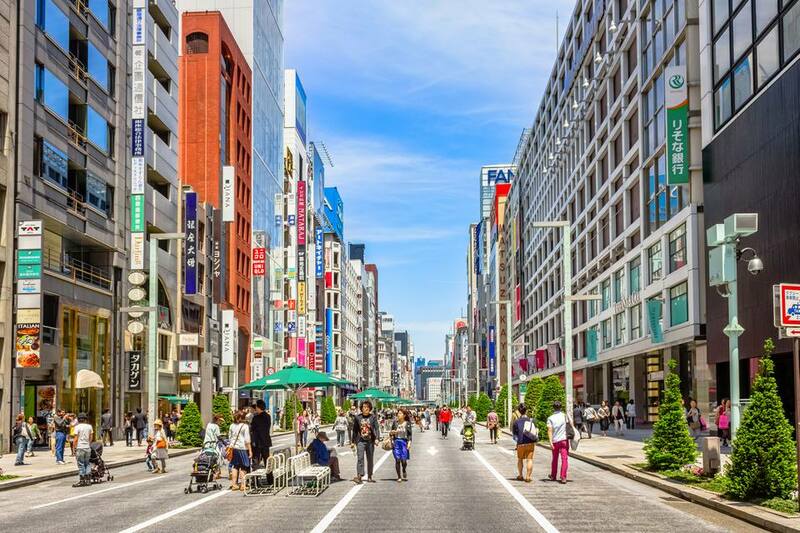 Ginza is commonly referred to as Japan’s answer to New York’s 5th Avenue or London’s Bond Street, but Tokyo’s most famous shopping district traces its history farther back than either one of these high-end enclaves. In 1872 the freshly de-isolated Japanese nation remade Ginza into a Western-style quarter, complete with brick buildings and the nation’s first sidewalks. The great noble families of Japan who once sold kimonos and dry-goods transformed their businesses into department stores. Although altered for the modern era, some of these department stores still exist today. The best time to see Ginza is on Sunday afternoons, when the main drag of Chuo-dori is closed to traffic. Gin-bura, literally “Ginza wandering,” is the Japanese term for walking Ginza’s immaculate promenades. While this area has a reputation for luxury retail and expensive cuisine, it’s also home to some reasonably priced shopping malls and accessible eateries. Whether you’re down to just window-shop or shell out a few hundred for a Michelin-star meal, Tokyo’s Ginza has something for everyone. Ginza’s iconic crosswalk is second only to the scramble crossing in Shibuya. This is where the two major thoroughfares of Harumi-dori and Chuo-dori intersect to form the neighborhood’s pedestrian core. Cut through the crowds to the Wako department store on the northern corner, recognizable by its famous Seiko clock tower. Miraculously spared from destruction in World War II, the original Hattori building was an early purveyor of clocks and watches, but is best known today for its window displays and delectable sweets shops. For an unforgettable cultural experience, see a show at Ginza’s Kabuki-za theater. One of Japan’s traditional arts, Kabuki is a hybrid drama of dancing, singing, flashy costumes and extravagant makeup, typically performed by an all-male cast. The theater offers pre-sale and day-of passes, for both matinees and evening shows. If you don’t have the attention span for an entire play, tickets are available for individual acts, starting at around 600 yen. Ginza is home to the biggest Uniqlo in Japan, the company’s second largest flagship store in the world after Uniqlo Shanghai. With 12 floors and nearly 5,000 square meters of space, this superstore carries a comprehensive selection of apparel, including ultra-light down jackets, flannels, and the immensely popular Heat Tech line. Uniqlo clothing is a longtime staple of Japanese fashion, known for its iconic combination of function and style. This location also offers the special service “MY UNIQLO,” where customers can customize Uniqlo tote bags with their own original designs. Lupin is an unexpected hideaway in the thick of busy Ginza. Open since 1928, this discreet basement bar was once frequented by Japan’s literary elite. While no longer the haunt of authors and playwrights, Bar Lupin’s dusky decor recalls the artistic salons of its Showa-era past. The drinks are exquisite, albeit pricey. A moscow mule in a copper mug is their signature cocktail, but the bartenders also pour concoctions with names like Charlie Chaplin (apricot brandy, sloe gin) and Golden Fizz (gin, lemon, egg yolk). Beloved by stationery fans, this century-old store is more than just a place to buy postcards. Ginza Itoya is a multi-level emporium that sells a dizzying selection of pens, pencils, art supplies, calligraphy brushes, and office-related miscellany. The entire floor of patterned washi, or Japanese decorative paper, is considered one of the best in Tokyo. Visitors can design their own notebook, and even purchase custom-engraved luggage tags for their flight home. On the top level is Cafe Stylo, a restaurant that serves vegetables grown in an indoor farm on Itoya’s 11th floor. The 2011 documentary Jiro Dreams of Sushi immortalized Jiro Ono as the world’s most enigmatic sushi chef. He and his sons still operate the 3 Michelin star Sukiyabashi Jiro, the tiny, 10-seat sushi bar in a Ginza train station famous for its omakase. Reservations can be made through your hotel concierge, at least one month in advance. Guests at Jiro’s restaurant eat with their hands, and the dipping of soy sauce is highly discouraged (read: basically forbidden). To get the most out of your experience, it’s best to read up on the complete rules of sushi etiquette. If you’re starting to drown in the sea of Ginza skyscrapers, visit the nearby oasis of Hamarikyu Gardens. A former villa and feudal duck-hunting spot, Hamarikyu is now a modern park and Japanese-style landscape garden, located on the edge of Tokyo Bay. The brackish ponds change level with tides, and there’s a wooden teahouse where visitors can enjoy a freshly whisked cup of matcha and a traditional Japanese sweet. Hamarikyu is particularly photogenic during the cherry blossom and fall foliage seasons. If you’re traveling to Ginza from Asakusa, catch the Sumida river bus to Hamarikyu pier. Two of the nine English words on Cafe de L’ambre’s quaint website tell you everything you need to know: Coffee Only. In business since 1948, until recently this cafe was managed by supercentenarian owner Ichiro Sekiguchi (he was 103 when he died) whose dedication to his craft rivaled that of sushi chef Jiro Ono. Baristas here weigh coffee beans on a small scale before grinding, and prepare each cup of coffee with a special cloth sieve. More than your average Japanese kissaten, some of the coffee beans here have been aged for over 40 years. Ahead of the 2020 Olympics, Tsukiji Market has been moved from its original spot southeast of Ginza to a new location. Although Tokyo’s tuna auctions are now off limits, there is still a lot here to explore. The outer market is where you can get an eyeful of interesting looking seafoods, and also buy chef-grade kitchen knives. After shopping, get your uni fix at Unitora Kurau, or dig into some chirashi at Sushikuni. For oyster lovers, there’s the yummy Kakigoya. Plan to visit Tsukiji early, as most places close in the afternoon. In addition to the abovementioned Wako, there are a number of Japanese depato with illustrious histories and covetable retail. Descend below the streets to the basement floors of Matsuya, where you’ll find a mouth-watering food hall that puts the food courts of American malls to shame. Started as a kimono shop in 1673, Mitsukoshi has an excellent selection of high-end retail, and diverse group of restaurants on the 11th and 12th floors. Finally, don’t leave Ginza without peeping the jewelry at Mikimoto. The inventor of the cultured pearl, founder Kokichi Mikimoto had dreams of “adorn[ing] the necks of all women around the world with pearls,” according to company history. Gekkoso is Ginza’s go-to art supply store. Established in 1917, this place has long served Tokyo’s aspiring artists. The shop sells their original products (paintbrushes, notebooks, postcards) and houses a gallery and cafe on the basement floor. If making art is not your thing, check out some of Ginza’s many galleries, including the Graphic Gallery, a haven for graphic designers with a small library of design books. Architecture nerds might also want to walk by the Shizuoka Press and Broadcasting Center, a cylinder-shaped structure with cantilevered modules designed by Kenzo Tange. Similar to Tokyo’s Memory Lane, this neighborhood was a site for post-war black market activities, and it’s maintained some of its seediness for the sake of nostalgia. Gado-shita, literally “below the girder,” is an area under the train tracks of Yurakucho station. These dim alleyways are populated by restaurants that serve unpretentious izakaya-style food and tall mugs of beer. When you’re ready for another department store, you can visit the nearby Hankyu Men’s Tokyo, a multilevel emporium that specializes in high-end menswear. If you’ve ever wondered what Japanese people ate between the years of 1603 and 1868, Edo Slowfood Mikawaya is the perfect place for you. Inspired by one of the oldest Japanese cookbooks in existence, this store creates reproductions of recipes that Japanese people enjoyed during the shogunate. There’s an excellent selection of high-quality rice, seasonings, rice wine, and miso-based sauces. If you’ve never been, you’re in for a treat. Tokyu Hands is a chain of megaoutlets that exist all over Japan, but the Ginza location, with its moderate 5 floors of merchandise, is an access point for a Tokyu Hands newcomer. This place sells practically everything: art products, backpacks, cosmetics, stationary, suitcases, colorful umbrellas, housewares, and tiny inventions you’ve never seen before. Near Chiyoda station stands a monument to Japan’s most famous monster, the mighty Godzilla. Though fans might find him slightly underwhelming, this particular godzilla statue has been here since 2018, a considerable upgrade from the previous petite person-sized version. Regardless of how you feel about this radioactive reptile, this is a good place to get your bearings before moving onto the next portion of your Tokyo itinerary.